Happy New Year! We’re welcoming 2017 with our Designer of the Month, the talented Hanna Maciejewska. As befits the start of a new year, January - The Month of Resolutions features 9 new techniques to try. And for the brand new knitters who are just itching to knit something other than a scarf, we have a selection of four sweaters that are easy, but don’t reveal beginner status, in Learning to Knit? Here’s your First Garment. Gradients are all the rage so we turned to Laura Bryant, designer and yarn dyer extraordinaire, for her thoughts, newest patterns, and gorgeous yarns in Working With Gradients. This month there is an ending and a new beginning for the editor of this newsletter. Gayle Clow is bidding adieu to Patternfish. See From the Ambassador’s Desk for her farewell and where you can find her next. It wasn’t my intention to select really warm garments for this month’s choices, it just happened. That’s January in Canada for you. I ought to be wearing fingerless mitts as I work, snow blowing, wind howling, weather worsening outside my window. These garments do make me feel warmer just by looking at them. On to the needles! Cozy, cuddly, with a few extra knits and purls for decorative effect, take a perfect winter style from classic to intriguing. Great size range from 27” to 46.75”, worsted weight, easy to knit, what could be better? This simple, classic style simply cries out for a soft yarn in a luxurious fibre. It’s not at all difficult to knit; the shaping is simple enough for an adventurous beginner, and the chevron hem is a 2 row repeat. Result - elegant and cuddle-worthy. I saw this pattern and in no time I selected it for an Editor’s Choice. Knit a coat, now there’s an idea, especially for someone whose stash is threatening to take over her office. Why this coat? It’s designed by Deb Hoss so the pattern will be superb; it’s garter stitch so it will be warm and not likely to ‘seat out’, it has a high neck and collar (strangely not every coat does), and the colour blocking allows flattering colour above and dark, minimizing colour below. What a charming sweater: the colour, the top-down seamless knitting, the raglan sleeve shaping, the ribbed side panels, and the easy moss stitch texture. Kate Oates makes sure it will fit very well with her use of short rows. This month, we have selected patterns in worsted weight yarns for beginning crocheters. There are two vests about as different from one another as they could be, a blanket made of six different stitch patterns, and a sweet bolero for babies to 3 year olds. The latest book from the Cabin Fever team, Deb and Lyn Gemmell, coauthored by designer Elizabeth Fallone, is Hoodies & Pullovers sized for the in-between ages, 4 to 14 (chest sizes 25” to 40”) and designed especially for boys, a sadly neglected cohort. Find crewneck, hoodie, v-neck, henley, and shawl collar variations, all knit no-sew, top-down. Hoodies and Pullovers recognizes that children and teens come in all sizes and shapes, so this book provides everything you need to make that new pullover fit. And no worries, the knitting police will not appear at your door if you make one of these for yourself or your daughter. If you don’t need the whole book, there are individually available options: the Kid’s Crewneck, the Kids V-Neck, and the Kid’s Henley, handsomely modelled on a dad. Looks good! The worldwide knitting community is vast and vital. Hundreds of thousands of new knitting patterns have been added to the inventory since on-line sales of patterns began just 10 years ago. And brand new knitters are coming on board daily. They are often offered only the simplest possible of patterns - long scarves, short scarves, skinny scarves, wide scarves, every variety of scarf. But impatient beginners want to make a garment, so here is a collection to begin the new year. Each pattern is in easy-to-find worsted weight yarn that will knit up at a satisfying clip. This children’s sweater, designed in Lettlopi yarn (the worsted weight baby sister of bulky weight Lopi), has the assured look of an accomplished knitter’s work. A child’s sweater is a good interim step before moving to adult sized. Elizabeth Smith’s Concetta Cardigan is a very good choice for a first cardigan. It’s knit top down, there is very little shaping, and each step is clearly explained in detail. Classic Elite Yarns’ well-named Easy Knitting pattern, circa 1992 (yet looking surprisingly up-to-date), is a very easy-to-knit pullover with shaping only at the neck. It uses two worsted weight yarns - a solid and a variegate or hand dye. Perfect for a new knitter to play with yarns. Easy Colour Blocks from Cabin Fever was designed with the beginner knitter in mind. In addition to everything a first-timer needs to know, there are options offered - stand-up collar, doubled-over neckband, ribbed or vented hem, a-line shape. Make it your own.. Here are a few of Patternfish customers’ favourite seamless knits: Fortitude, Cabletta, Naturally Yours, and Laelia. Hanna models some of her designs and, as as she says, she has been, “quite generously equipped by the bust fairy” so she understands very well the challenges of making garments not just to fit, but also to flatter. Her close-fitting patterns include directions for bust area short-row shaping, so no matter how much attention you’ve received from the “bust fairy”, you can make her designs just right for you. How did you become a designer? My grandmother taught me how to knit when I was a little girl. In high school, I knit sweaters all the time. I wanted to own and wear something unique, something I thought up by myself, and made by myself. When I moved to the US and later to the UK, knitting became less important since there were so many other exciting things to explore and places to visit. When I returned to Poland, I realized that knitting and designing knitwear are truly my biggest passions. When I joined Ravelry, I posted projects just for fun. After a dear friend, who is a talented hand dyer, created a special yarn for me, I designed Colors of Kauai. It was so well received that I decided to write down more of my designs – this is how it all started. What inspires you? Everything! Most people who create things say this, don't they? It is all true! The world is full of colors and shapes. A huge part of my inspiration originates from online sources. I can spend hours browsing Pinterest, Tumblr, and similar sites, checking out current fashion trends and allowing myself to get inspired. Most of the time, my designing process starts with a sketch, a preliminary swatch and a collection of stitch ideas. However, this does not always work out, and I sometimes change them on the go. I’m a hands-on designer, and very often, useful ideas for improvement come to my mind while I knit up a design. Do you have established goals for your business other than the important issue of selling patterns? One of my goals is to establish a loyal customer base, so I do things that are not directly aimed at selling patterns, or that might seem loss ventures, such as traveling to fiber festivals and teaching classes at knitting retreats. These are aimed at getting known among a clientele that prefers a more traditional approach to their knitting hobby, and might never have heard of online pattern selling sites. These are customers I would have otherwise not reached. What did you have to learn or unlearn to be a designer? Being a knitting designer means thinking about how to best spend my time, allocating time for certain tasks, delegating others, or altogether ditching things that distract from my overall goal. Being a designer also means thinking about the customer, not so much about me. If I hear from customers that they found it hard to do the p5tog in an otherwise lovely lace pattern, I try not to overuse it, even though I personally love to include a few challenging maneuvers. Being a knitting designer means that while I would love to develop more garments that agree with my particular body shape, I do understand that with this my figure, I’m in the minority, and that I need to develop a variety of options that flatter totally different body shapes. Thankfully, I have a large and visually diversified extended family who are always glad to receive my prototypes. Speaking of family, mine is very understanding, and everybody helps me devote my time to developing my designs. My husband is a wonderful photographer who scouts out lovely places that make interesting backdrops for pattern photographs, my cousin models many of my designs, and my mom is the best cook on earth and the best grandmother, too! What are your best selling designs? I believe it would be good old Ink, one of my first designs that is also one of my favorites. Which designs are your personal favourites? It is almost impossible to choose one favourite design, and I kind of consider all of them my “babies”. Besides, my favourites change all the time! At the moment, my favourite one is the “Softly” cardigan. Another favorite cardigan of mine is Wink, the worsted-weight version of one of my most popular patterns, Ink. Cabling is my favorite knitting technique. I also like the Color Me In pullover because of its subtle colors on the sleeves and the many possibilities the colorwork pattern offers for individual interpretation. And, of course, I love Moyen Age and Cabeladabra They are my most favorite pullovers of all. I just love the expressive necklines and the overall shaping of these garments. You see? I simply cannot pick just one. The internet has become so important to selling knitting and crochet patterns. Are there any aspects of it that you think are harmful? The Internet has made the knitting world a lot faster and enabled me to keep in touch with knitters around the world almost in real time, making my business possible in the first place. The Internet has another impact on global business: sometimes content gets re-published by people with dishonorable intentions or who believe they have the right to redistribute a pattern as they see fit once they have bought it. How do you think the knitting/crocheting/fibre world will change in the next 10 years/why? I believe that it will become even more beneficial than it is right now. Life is more and more stressful for many people and most of us live in such a hurry that we are constantly rushing! Yarn-related hobbies can be very therapeutic. Knitting and crocheting are supremely relaxing, and can significantly reduce stress and anxiety. With the multitude of online resources available now that help crafters to learn new techniques, I hope that more people will take up this rewarding hobby. How did you come to the decision to list your patterns with Patternfish? It was an easy decision! A while ago, I found the website, and I really liked what Patternfish was doing. The conditions for designers are very favourable, with a lot of routine tasks done by the site for the designer, leaving more time for designing, so I wanted to get listed right away. Hats, especially cabled ones, are very important in Hanna’s repertoire, and seeing as how it’s January, it’s a good time to share a few. Find all of Hanna's designs here. We are welcoming a new pattern publisher and two new designers. What does Knitacation mean? My first thought was knitting vacation, which was close, but the publishing name selected by this trio is a combo of knit, relaxation, and education. The trio designs as a team and contribute their individual talents and expertise: Annika’s graphic skills make the patterns attractive and workable, Deb focuses on detail and editing, Elizabeth brims with new pattern ideas and techniques. Four patterns are currently available, but more will appear soon, accompanied by technique videos. Be sure to click on Gradient and see the fascinating variation in the pattern when it’s arranged in a different way. The Petticoat Creek Cowl is an expression of Gayle Clow’s decade-long love for reversible cables, knitable in either infinity or close-fitting sizes. The Saturday Bread Baker’s Mitts (yes, that is homemade bread in the photo) were inspired by the thick cotton mitts bakers kept on their wrists to swing into hand protecting action. Jem Arrowsmith debuts at Patternfish with her Tequila Sunset Shawl, a fanciful remembrance of a holiday evening, gazing at the sea, created with intarsia, lace, and stockinette stitches. Three Seas is an unusual cowl that sits beautifully around the neck, courtesy of short row shaping and dropped stitches. Whether or not you are a person who likes to make New Year’s resolutions, this is one of the times of year, along with the start of school, when new learning seems appropriate. To celebrate that, here are 10 patterns that will introduce you to new techniques. From the technique maven of Nova Scotia, Lucy Neatby, comes the lesson on learning to double knit (the method, not the DK yarn), with her scarf, String of Pearls. Anne Hanson creates lace for experts but this pattern, Pompa, is perfect for those new to the technique, with written out instructions as well as charts. Shawn Glidden unvented this unique ribbing/garter stitch in 2011, calling it ribbon stitch. It’s an intriguing, flat, reversible fabric created with just knits and purls. The instructions for Lena Fedotova’s Tunisian crochet pattern, Bluetail, include 6 terrific photos that make the process crystal clear. Teacher, writer, and designer Kate Atherley introduces entrelac in-the-round. Easier than knitting entrelac flat according to the pattern creator. One of recovering-attorney and outstanding designer Jennifer Dassau’s specialties is short rows, beautifully demonstrated and explained in her Triangulate garter stitch shawl. From Reynolds comes this very easy stranded knitting hat and mittens pattern. Each piece is knit flat, following the charts, then seamed. Learn to add beads to your knitting, one at a time, with a crochet hook, from this easy scarf pattern from Kira K Designs. Fiber Trends has been well known for their felted project patterns for decades and the detailed instructions for this bag prove they know their stuff. Nina Machlin Dayton’s reputation for excellent instructions is borne out by her modular technique Montague Street Cowl. Gradients - we fall in love with the subtle colour changes, we’re fascinated by them, but a question remains, what do we do with them? Laura Bryant first became interested in graduated shades in the ’80’s, when she launched her yarn and pattern company, Prism Yarns. What she wanted to achieve was difficult at the time, so she abandoned the idea until now. Happily, her dyeing skills have been honed and she has returned to gradients with a vengeance, along with her associate, Brigitte Reydams. These two walk every morning, bouncing ideas off one another. Take a look at this set of gradients called Into the Woods. Can’t you just imagine walking beneath a canopy of trees and just needing to make those colours into a shawl? 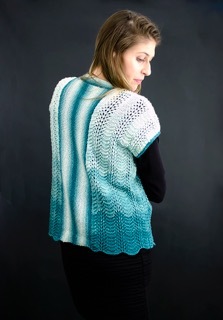 Brigitte Reydams’ design, Long Gradient Nina Jacket and Laura’s Gradient Wrap demonstrate the fusion of yarn and pattern. When faced with the problem that her 8 skein yarn packs didn’t have quite enough yardage for all sizes, the Brigitte/Laura team added “pop” colours to the designs, like this Short Gradient Nina Jacket. Laura and Brigitte are deep in the throes of new designs based on new yarn gradients like Berry Compote and Forest Glen. The newest patterns are not available to purchase right this minute, but check Prism Yarn designs towards the end of January and you’ll find the very latest designs in these stunning colours. Here are a few photos of what’s to come. Those of us who live in the Northern Hemisphere become obsessed with keeping warm, so much so that many pattern collections featured in winter months completely ignore the knitters and crocheters who bask, or swelter, in sunshine and warm breezes. Here’s selection for those people and the lucky ones who leave the cold behind for a cruise, or time on a beach. I am bidding goodbye to Patternfish after 6 years. What a terrific experience it has been: I've read thousands of patterns, introduced hundreds of new designers, and had the pleasure of talking to thousands of customers every month with this newsletter. It’s hard to believe there have been 64 in all. It is time for me to move on, but the loss of writing and contact with people in the knit and crochet community grieves me. A friend suggested I write a blog to satisfy those needs. What a perfect idea it was. Thank you, Rachel. Please join me at my website, Knits From The Woodlot. I’ll be writing about the things that interest me about the fibre and design world. Over these years, designs of my own have been struggling to get from my head, to needles and yarn, and on to a page of their own. And so I've written the first three, had them tech edited and test knit, and present them to you here in New Publishers and Designers, under the name Knits From the Woodlot. More designs are on their way. © Copyright 2017 Patternfish Inc. All rights reserved. Feel free to share this, in its entirety, with others. To subscribe, create an account at Patternfish.